Extensive Reading (ER) plays an important role at BIG BOW English Lab and I believe it is a key factor in helping to build on and maintain the English skills of young returnee students. I often try to get students hooked on a series in hopes that they'll want to read all the books in it. 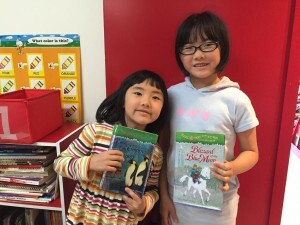 Students have more success when they try to read books in the same genre or series because so many of the themes, language, and characters are familiar. This type of reading is called narrow reading. In my opinion, one of the best children's series for narrow reading is Magic Tree House. The first and last chapters of each book are almost identical and so is the banter between Jack, the cautious sensible older brother, and Annie, the spontaneous younger sister who is always getting in trouble. Vocabulary is recycled and the books increasingly become more difficult as children move through the series. On that note, I'd like to introduce you to the Magic Tree House sisters. One of my returnee students got hooked on Magic Tree House after we read the first book in class together to help the students make the transition to chapter books. It took less than two years for her to read all the way to book #45! A few years later, her little sister decided to follow in her footsteps. She just completed the last book at the end of March. I was very impressed with their dedication. Working through the series improved their reading skills and helped them develop a pleasure reading habit. Congratulations to the Magic Tree House sisters!